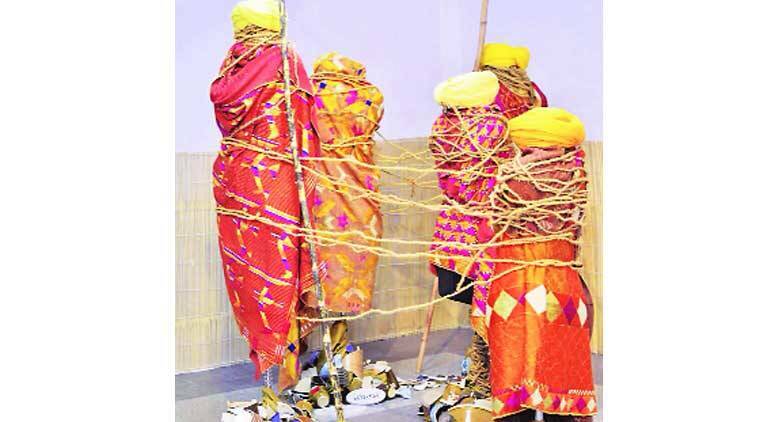 Organised by Kirandeep Kaur, the exhibition celebrates Punjab’s traditional Phulkari embroidery. A palanquin decked with phulkari linen, a silhouette of Bhagat Singh made from wooden blocks by artist Jagdeep Singh from Nakodar and old chests and doors with engraved blocks of Gurmukhi script created by the store1469 are among the exhibits at this year’s Mela Phulkari. Organised by Kirandeep Kaur, this exhibition at India Habitat Centre celebrates Punjab’s traditional embroidery. “This year we’ve interpreted phulkaris through an art exhibition,” says curator Alka Pande. Other exhibits include tapestries with various phulkari patterns, which tell visitors stories of how garments were handed down generations and are still a part of the legacy. “Mela Phulkari is a cultural construct, which includes not just the living traditions of Punjab, but goes beyond the art of making. It encompasses the philosophy of life, myths, legends and allegories, and the dreams and aspirations of the women of this agriculturally fertile land,” says Pande. At the mela, one will also find hand woven phulkari dupattas, hand fans and miniature manjhis (traditional cots). Last year, it had a collection from writer Khushwant Singh’s family while this year it is an ode to freedom fighter Bhagat Singh. There is also a Punjabi trousseau collection designed by students of NIFT.